I too share your passion for the Wars of the early 18th Century and earlier going back to the Nine Years War forexample I also feel, like you, that current rules are lacking the little differences that prcceded Marlorough. I hae read your rules and find them interesting One thing that I think is lacking are pikes. As you know pikes were still widely used in the Nine Years war and would have had effects on both shooting and melee. In Ireland for example a large proportion of the ad hoc "Militia" type formations would be armed with pikes and even scythes. How would you account for these in your rules ? Pikes are included in the rules, because the number of dice for shooting and melee are allocated based on the type of figures present. 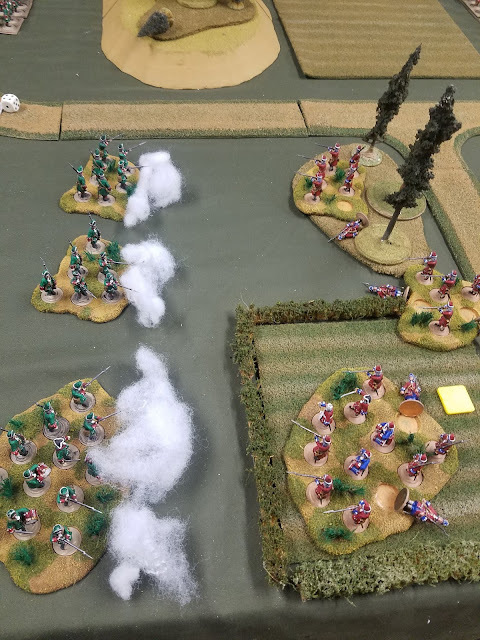 The presence of pikemen in the formation will impact both fire combat and well as hand-to-hand, pike are particularly effective against cavalry. I am not currently satisfied with the infantry vs infantry melee results. I am still considering ways of making it possible to last more than one turn (specifically to allow for a "push of pike"). Improvised weapons such as scythes and the whole assortment of weapons carried by melee-happy Highlanders need to be considered separately. I am working on a version of these rules for the Great Northern War and will probably do versions for the Williamite war in Ireland and the Jacobite Rebellions in Scotland. I am not a fan of "generalized" rules and prefer to have different sets that consider only one small era. The mechanisms used may be very similar but the modifiers and ways that they are applied would have to be different.